Last week as I was writing this fun post about our favorite Western United States places to visit, I mentioned checking out the fresh cherry stands that litter the sides of the roads around Flathead Lake in Montana. I was excited when a sweet friend gave me a plentiful amount of her tomato crop a few weeks ago. Being the foodie that I am, I squealed with delight! I had tomatoes stacked upon tomatoes on my countertop. It was a foodie's dream! Here is a fun little fact. This salsa was the first recipe I posted on this blog, back in September of 2010. I knew nothing about food photography, and I didn't even really know how to talk about food. I remember getting everything set up to take pictures and thinking it was such an ordeal. I was so excited to be chosen to host a party creating my ideal summer day, made better with Nestlé Drumstick Pretzel Dipped cones! I knew immediately what I wanted to do. The dropzone where we skydive is our second home in the summer months. 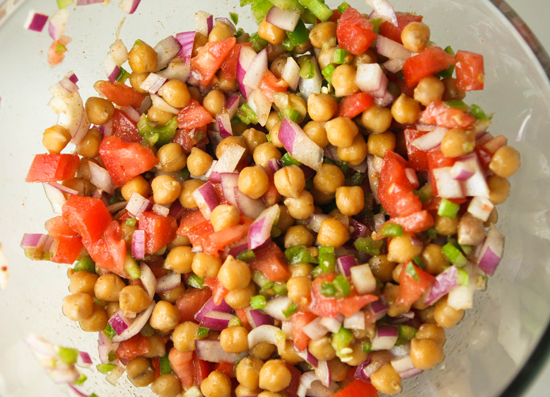 Combine fresh tasty vegetables with chickpeas in a protein packed salad. Each crunchy bite offers a scrumptious filling salad, side dish or filler to a wrap. This colorful salad that brings summer to life in any season! Fresh-ingredient salads rock. They're pretty and fresh and tasty and versatile. My husband and I make a killer fresh salad that rivals this one, and I'll share it before summer arrives. By the way, where is summer? We got teased with a bit of warm weather last week, so now the cold and snow and freezing rain are even harder to swallow. I'm not convinced that summer will ever welcome us into her warm embrace. This colorful salad helps me to believe that it might happen, though. It makes me think of lunches outside with my boys as we sit barefoot on the grass, wiping beads of sweat from our foreheads. Mmmmmmmm. Back to my cold reality known as Minnesota. If you, too, enjoy tricking yourself into believing it is summer when it is in fact not, make this salad! My family loved it and the entire batch was gone within 24 hours, despite the lack of warm weather. A salad that will make a healthy choice delicious and unforgettable! Drain 2 cans of chickpeas and place them in a medium bowl. Add 1 tomato diced, 1/2 cup diced cucumber, half of a small red onion diced and half of a seeded jalapeno minced. Pour in 2 tablespoons olive oil and 1 tablespoon vegetable oil. Squeeze two tablespoons of fresh lemon juice in and mix in 1 teaspoon ground cumin with a quarter teaspoon cayenne pepper. If you like to mix things up, add in 1 teaspoon dried mango powder! You can chill the salad in the refrigerator for an hour or serve it room temperature. Enjoy! Kitchen Tips: If you want to go fresh and do as the recipe suggests, soak 1 cup of dried chickpeas in water overnight. Drain the chickpeas and bring to a boil in a large saucepan in 4 inches of water. Reduce heat to medium and simmer for 2 hours, or until chickpeas are tender. The first thing we did upon making this was throw it onto a piece of flatbread with sliced turkey and black pepper. It’s a great way to make an easy meal and stay healthy - it was delicious! A piece of lettuce would have added a nice crunch, but that had probably been juiced, as well. No mayo needed! It made a delicious, healthy dinner wrap. The next day for lunch, I used it as a topping for my boring baked chicken and cottage cheese. And I ate the last of it with crackers for a snack. I can think of about 100 other things I'd like to put it in and on and in between. Or, I wouldn't mind eating it straight from the container while having a picnic lunch with my family, the beating sun making the tops of our heads hot. Ahhhhh, a girl can dream. A colorful salad that brings summer alive in any season! In a large saucepan, cover the chickpeas with 4 inches of water. Bring to a boil and simmer over moderate heat, stirring occasionally, until tender, about 2 hours; drain. In a large bowl, combine the tomato, cucumber, red onion, jalapeno, olive oil, vegetable oil, lemon juice, cumin, cayenne pepper and mango powder. Add the chickpeas and season with salt. Serve the chickpea salad at room temperature or slightly chilled. Total delicious, Mexican yumminess. 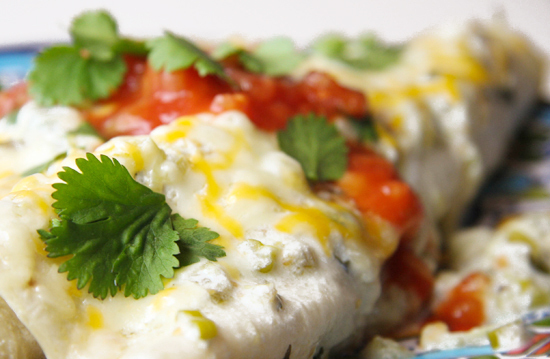 Lots of chicken in a creamy salsa verde that’s full on flavor with melted cheese on top. Fresh cilantro finishes the recipe. The proof is in the YUM! I should have been born Mexican. Mexican food and drink make me swoon and salivate. Tortillas, cheese, beans, salsa, tequila, hot peppers. I could bathe in the above ingredients for weeks on end. I am constantly scanning cookbooks, magazines and the internet for new Mexican concoctions. I found this Salsa Verde Enchilada recipe in Good Housekeeping and instantly adored it because it was Mexican and because it was unique. Using meat from rotisserie chickens? Brilliant! Why didn't I think of that? Have you ever started eating one of those chickens and ended up finishing the entire thing? Yeah, me either. This recipe makes a total of 16 enchiladas in 2 separate baking dishes, so halve the recipe if you wish. 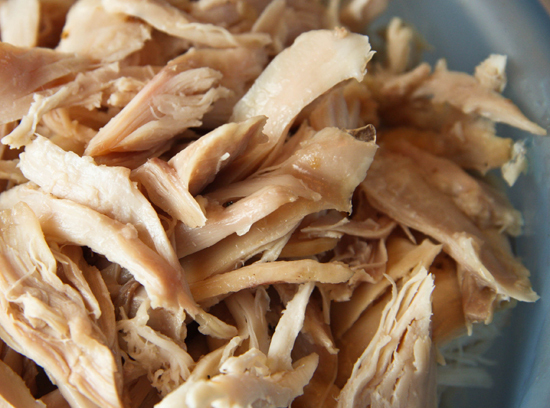 Remove the meat from 2 rotisserie chickens and coarsely shred it. Place the shredded meat in a medium bowl, discarding the skin and bones. Evenly coat the chicken with 1/2 cup salsa verde. Preheat your oven to 350 degrees F and grease two 9x13 baking dishes. Heat to boiling over medium-high heat. Boil for 2 minutes, stirring occasionally. Stir in 2 tablespoons of fresh, chopped cilantro and reduce the heat to low. With tongs, place 1 tortilla in the salsa verde mixture, coating it completely. Heat it for 10 seconds and place it on a sheet of waxed paper. Top with about 1/3 cup of the chicken mixture, and roll up the tortilla. Place it, seam side down, in the baking dish and repeat with the remaining tortillas and chicken, arranging 8 tortillas in each dish. Stir and spoon the mixture over the filled tortillas. Cover the baking dishes with aluminum foil and bake in the preheated oven for 15 minutes. Remove the foil and sprinkle the enchiladas in each dish with 4 oz. shredded Mexican cheese and fresh cilantro. Bake for 5 more minutes. Total delicious, Mexican yumminess! For another great Mexican recipe check out my Chicken Enchilada Bake. Delicious food, easy prep! 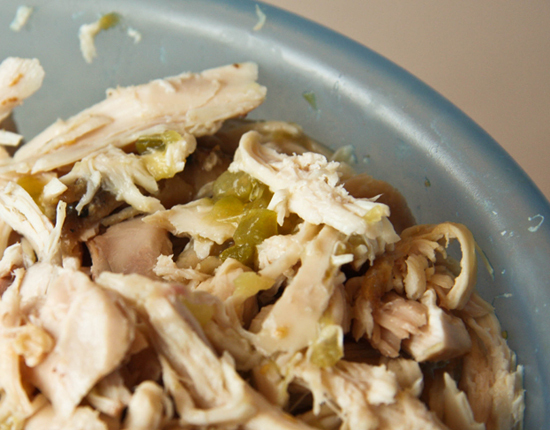 Remove meat from chickens and coarsely shred; place in medium bowl. Discard skin and bones. Evenly coat chicken with ½ cup salsa verde. Preheat oven to 350 degrees F. Grease two 9x13 glass or ceramic baking dishes. In a large skillet, heat remaining salsa verde, green onions and lime juice to boiling over medium-high heat. Boil 2 minutes, stirring occasionally. Stir in 2 tablespoons cilantro; keep warm over very low heat. With tongs, place 1 tortilla in salsa verde mixture; heat 10 seconds. Place tortilla on waxed paper and top with about 1/3 cup of the chicken mixture. Roll tortilla and place, seam side down, in the baking dish. Repeat with remaining tortillas and chicken, arranging 8 tortillas in each dish. 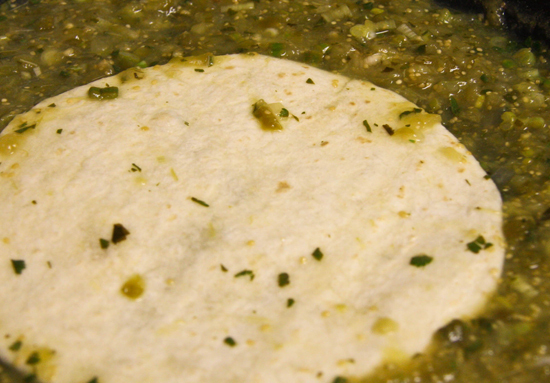 Stir sour cream and broth into remaining salsa verde in skillet; spoon over filled tortillas. Cover baking dishes with foil and bake 15 minutes. Remove foil; sprinkle each with ½ of the cheese and 1 tablespoon cilantro. Bake 5 minutes longer. A delicious classic that can be made spicy or plain and goes great with just about anything! An easy guacamole recipe with salsa that friends and family will love!